Spending some time in Hawaii and enjoying the local food (especially the seafood) we wanted to share back to everyone some of the thinks that we have been enjoying. This one is extremely simple, very good for you. You have to be into raw tuna and if you're not you could try searing it take away some fo that texture. Give it a try. Combine soy sauce, oil, green onions, and Serrano in a medium bowl, whisk to blend. Add tuna to soy sauce mixture; blend until well coated. Refrigerate, covered, for at least one hour. 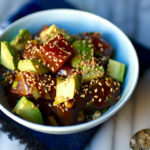 Add sesame seeds and avocado to tuna mixture; toss gently to blend. Divide tuna mixture evenly between four bowls; serve immediately.